Welcome to Part 9 of our ongoing series “What to Make of the Credit Cycle.” You can view previous parts here, here, here, here, here, here, here, and here (some paywall, some not…roll the dice). Some lines of work pay more than others. While Americans have largely seen lackluster wage growth during the past year, the roughly 500 associates laboring at Milbank, Tweed, Hadley & McCloy just drew a large bump in pay, putting the law firm at the top of the legal heap in terms of salaries paid to attorneys just starting out. A spokesperson for the 690-lawyer firm confirmed that it is hiking associate salaries by $10,000 to $15,000, bringing a first-year associate's salary to $190,000. A second-year associate at the firm will now make $200,000, while an eight-year associate will pull in $330,000. The prior high mark had been set two years ago by Cravath, Swaine & Moore, which upped starting pay by $20,000 to $180,000, an industry standard that was quickly matched by Milbank and multiple other firms. Summer 2018 has really been the summer of money for Biglaw associates. Milbank got the party started by finally bringing NY (and its other offices) to $190K. Simpson Thacher upped the ante just two days later by matching the new salary scale and adding in special summer bonuses. And just a few days after that, Cravath reasserted its dominance as the firm that sets the market standard by increasing the standard base salary for senior associates over what was set by Milbank. Wages rose 2.7% from a year earlier in June, below the 2.8% increase economists had expected and the increase may make little difference because inflation is also picking up and could soon outpace wages, meaning many workers have no real increase in buying power. There are currently 6.7 million job openings — a record high. And the rate at which workers are quitting their jobs is higher than it was before the onset of the Great Recession. But wage growth is still noticeably slower than many economists and analysts expect (despite all the stories about employers desperate for workers). (PETITION Note: hopefully those associates don’t ever run the hourly calculation). 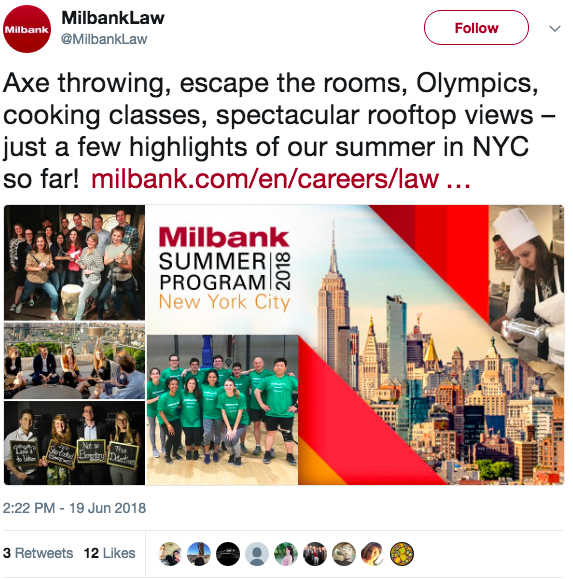 Nothing gives a realistic snapshot of life as a biglaw attorney like axe throwing, escape the room(s), the Olympics, cooking classes, and spectacular rooftop views. We’re serious. Having the aggressiveness, discipline and vigilance of an Olympic athlete is needed to navigate the halls of a biglaw firm (PETITION Note: sadly, they don’t teach you inter-office politics in law school). Knowing how to throw an axe may actually help lawyers wade through the morass. In fact, if we were associates, we would go on a shopping spree at Best Made and hang some dope-looking axes on the wall to leverage the intimidation factor. Escape the room? Junior associates will want to do that every Friday evening to avoid the inevitable partner phone call asking for an “urgent! !”memo on some esoteric legal question that more-likely-than-not will NEVER come up. By Monday morning, of course. (Hot PETITION tip: the likelihood of said partner reading that memo on Monday morning — let alone by the end of the following week — is roughly about 1.27%). Cooking classes? Sh*t. The closest you’ll get to cooking once you’re making that sweet $190k is receiving someone else’s via Seamless, UberEats or Caviar. In the office. Of course. Rooftop views? Awesome. There’s nothing more lit than having a bird’s eye view to thousands of New Yorkers living their lives eating drinking and being merry while you’re stuck in the office. Those views are a double-edged sword, broheim. Make no mistake about that. So, again, kudos to Milbank for giving its summer associates a realistic view of practice. *Milbank “promoted” this tweet, by the way, which means that it wanted the world to know that we’ve once again reached peak-summer-associate. We’re old enough to remember when the earth exploded and summer associate offers were reneged or deferred starting dates. This will end just as well.